Schools across the country keep EpiPens in their nurses’ offices in case a student has a severe allergic reaction. For years, Mylan Pharmaceuticals has been selling the devices to schools at a discounted price, giving them a break from rising costs. But the program also prohibited schools from buying competitors’ devices — a provision that experts say may have violated antitrust law. Mylan’s “EpiPen4Schools” program, begun in August 2012, offers free or discounted EpiPens to schools. Over 65,000 schools receive free EpiPens through the program; an unknown number of schools buy the epinephrine auto-injectors at a discount. Laws in at least 11 states require schools to stock epinephrine, and keeping a stockpile is incentivized by federal law across the country. As of last year, the EpiPen4Schools discounted price was $112.10, according to company documents. That is about a quarter of the cost charged to pharmacies at the time, according to data from Elsevier’s Gold Standard Drug Database. A Mylan spokesperson said this requirement is no longer part of its program, and did not say when the requirement was dropped. STAT found such language on EpiPen4Schools order forms dated August 2014 and June 2015. She added that there have never been purchase requirements to receive the free EpiPen auto-injectors. “It is illegal to issue a discount on the condition the customer not acquire a competitor’s goods — if the effect may be to substantially lessen competition,” said Herbert Hovenkamp, a University of Iowa law professor and antitrust expert. At issue is the notion of an exclusionary contract, which requires a customer to promise not to deal with a competitor. Exclusionary contracts are a common tactic for keeping a lock on a market, Hovenkamp said. But using such a contract while also having a dominant market share may hinder competition, which he explained can be an antitrust violation. 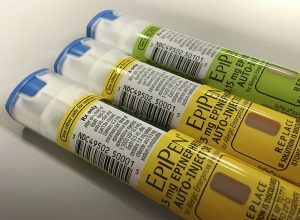 Last year, EpiPen made up 89 percent of the epinephrine auto-injector market, according to IMS Health, a market research firm. Schools might have to buy more auto-injectors in that 12-month window for a variety of reasons: they might use the auto-injectors and need to replace them, or the devices might reach their expiration date. Earlier this week, Senator Amy Klobuchar (D-Minn.) called on the US Federal Trade Commission to investigate possible antitrust violations in the pricing of the EpiPen. The fact that Mylan used to have such a stipulation may still be problematic, said Harry First, a professor at the New York University School of Law, who specializes in antitrust matters. The inflation-adjusted list price of EpiPens has increased by about 450 percent since 2004, according to Elsevier data. That rising price has become an issue for schools. John Torre, public information officer for Fairfax County Public Schools in Virginia, said that the district is worried that the price of EpiPens sold through Mylan’s discount program might change. Fairfax County Public Schools, Virginia’s largest district with over 180,000 students, orders about 1,100 EpiPen 2-Paks each year at the discount price offered by Mylan, Torre said. The district also receives about 400 EpiPen 2-Paks for free each year from the company. These agreements contain no restriction on a district purchasing auto-injectors from other companies. At least 11 states have laws mandating that schools stock epinephrine, according to the advocacy group Food Allergy Research and Education (which receives funding from Mylan). As of July 2016, all other states — except Hawaii — allow, but don’t require, schools to stock epinephrine that can be used for any student experiencing anaphylaxis. This article is reproduced with permission from STAT. It was first published on Aug. 25, 2016. Find the original story here.